Oh, I'm excited! My featured seller today is Canadian!! Lauren, the creator behind lostmitten, lives in Brantford, Ontario with her fiance, Paul. That's really quite close to here!! Lauren is quite crafty, dabbling in needlework, jewelry and button pin making as well as paper crafts and journal making. It is also pretty evident that she is a huge video game addict! From old school Nintendo and Super Nintendo to the newer Wii, you'll find quite a few items in lostmitten inspired by video games. Which makes a perfect gift for any gamer on your list! Just look at that cute little ring! Who doesn't recognize that green 1 up mushroom? In fact, I read somewhere that, for kids today, Mario is more recognizable than Mickey Mouse. Makes sense ~ what kid doesn't own some sort of a game console these days? 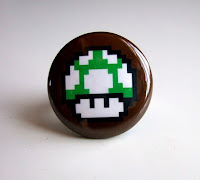 Now you can show off your love of old school Mario with this funky little ring. It's adjustable too, so it's sure to fit whoever you give it to! Speaking of old school Mario, how cool are these coasters? They are made with Perler beads and have a glow in the dark background, so you can be sure to locate your drink during the movie! 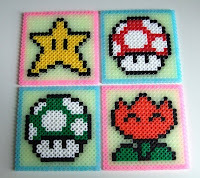 Each coaster features one of the power ups you find in the original Mario games ~ the invincibility star, the red power up and green 1 up mushrooms and the fire flower. This is a perfect gift for those teens going off to university ~ make sure they don't ruin their desk and coffee tables in style! Ok, I promise no more Mario... but just a little more geekery! :) These cute little kawaii buttons showcase a couple of surprised looking pigs and some adorable bunnies. I have to admit though... I'm not really sure what Kawaii is exactly. I think it has something to do with these little animals and cute vegetables with smiley faces... Either way, whether you know what it means or not, these pins are sure to make you smile! Still too geek for you? Well don't go away, lostmitten has a little something for everyone. 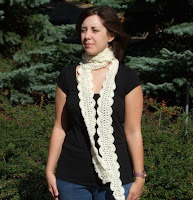 Take a look at this gorgeous crocheted scarf ~ it is simple elegance! The pretty cream colour and scalloped edges are sure to add a dose of femininity to any outfit ~ perfect for any night out, or that trip to the spa / salon. And the design is light and delicate enough to be wearable throughout winter, spring and summer (for those cool evenings). Simply stunning! 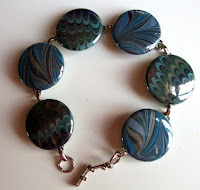 Lastly, I couldn't finish without posting a bracelet ~ and a button bracelet at that! You won't find much resemblance to my button bracelets though, but these buttons show off some beautiful Japanese Washi paper and Brazilian marble paper to create a wonderful retro look. The rich blue turquoise tones are perfect for the season! Those are my favourites ~ now it's your turn to take a look through lostmitten and find yours! Maybe you'll even cross a few people off your holiday shopping list! Remember that lostmitten is willing to do custom orders, so be sure to ask (especially if you see a design you like but want altered, or see something from her sold items you'd like duplicated). Also be sure to stop by her website and blog for more 90 day challenge features!